Catching criminals has gotten a lot more glamorous for some police forces around the world. Stopping drug dealers, transporting donated organs and promoting road safety are all assignments that have been aided by some of the world’s most incredible supercars. 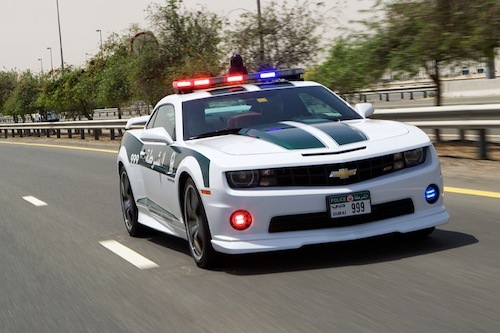 Police forces everywhere from Michigan to Dubai have become the lucky owners – or temporary owners – of Camaros, Ferraris and Lamborghinis. And although not all of the vehicles were used in high-speed chases, they’ve all played some part in criminal justice – even if only by strengthening relationships between police and the surrounding communities or promoting safe car tuning. 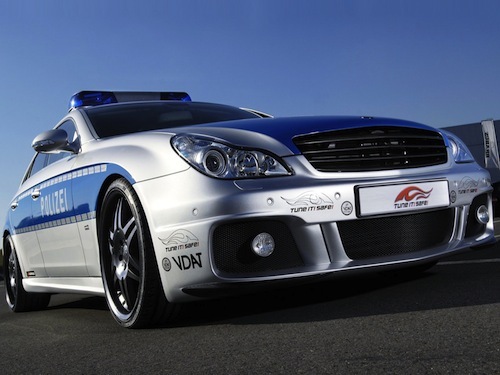 Take a look at the ten fastest police cars in the world and discover what contribution these awesome machines have made to police forces worldwide. The supercar accelerates from 0 to 62 mph (0 to 100 km/h) in 4.7 seconds and has a top speed of 155 mph (250 km/h). It’s powered by a 426 horsepower, 6.2L V8 engine and was named Best Muscle Car by local car magazines every year between 2009 and 2012. “We are confident that the Camaro’s ability to respond rapidly, by virtue of its high-performance V8 engine, coupled with its practical suitability for Dubai’s roads and ease of servicing, will make it an ideal patrol car for years to come,” explained Buti Saeed Al Ghandi, managing director of Al Ghandi Auto, General Motors’ Dubai Chevrolet dealer partner. Thanks to local sergeant Noel Clason’s special relationship with General Motors, the Bloomfield Township Police Department has struck a deal with the automotive corporation that allows officers to use a variety of sports cars on a temporary basis. 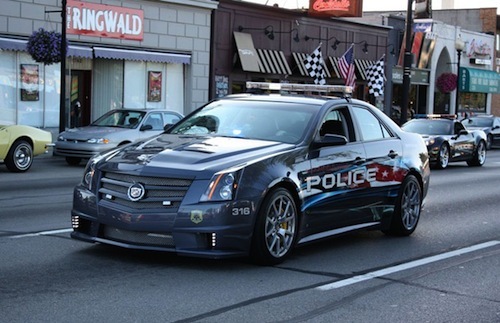 The Cadillac CTS-V pictured above joined the Bloomfield Hills fleet in 2009. These sleek high-performance vehicles are used in parades, classic car cruises, educational events, and to increase police presence in the community. “We’re very community-oriented, and this is a great way to help us interact with our residents,” says Clason. The car is powered by a 556 horsepower, 6.2L V8 engine and can go from 0 to 60 mph (97 km/h) in 3.9 seconds. According to General Motors, its top speed is 163 mph (262 km/h). After the vehicles have spent around 30 days with the police force, they’re returned to General Motors. 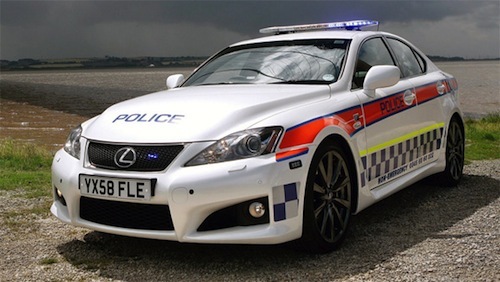 Humberside Police in northern England bought this modified Lexus IS-F in July 2009. The car can go from 0 to 62 mph (100 km/h) in 4.6 seconds and has a maximum speed of 168 mph (270 km/h), thanks to its 416 horsepower, 5.0L engine. The Lexus comes equipped with two high-tech radios, four cameras, and a computer platform that allows officers to access records and the national police database while on the road. According to Sergeant Mike Peck, the supercar is mainly used as a deterrent. However, the “command car” of the fleet’s Vehicle Crime Unit could also help the force run down drug dealers in high-powered sports cars, and it has been used to seize criminal assets, too. Peck says that the Lexus copes with the extra load of computer equipment without difficulty, and according to Humberside Police, it has extraordinary braking and handling abilities. 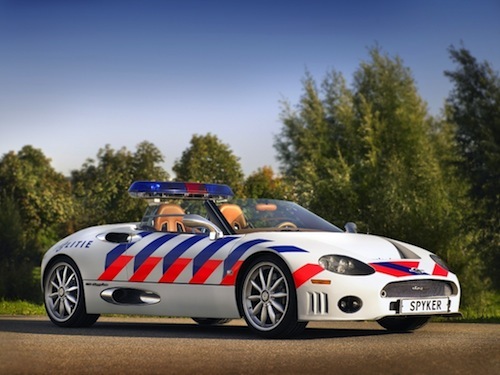 Police in the Dutch province of Flevoland must have been thrilled to bits when this Spyker C8 Spyder joined the force in October 2006. And the vehicle – which is outfitted with the local police colors and decked out with flashing police lights – doubtless scared the wits out of speed demons on Dutch roadways. The automobile was hand-built by Dutch sports car manufacturer Spyker Cars and is powered by a 400 horsepower, Audi 4.2L V8 engine. It can accelerate from 0 to 62 mph (100 km/h) in 4.5 seconds and has a top speed of 187 mph (301 km/h). Although it isn’t clear whether the Flevoland Police Department used the supercar for high-speed pursuits or simply displayed it at parades and public events, it would have surely added a substantial amount of credibility to the force. Police campaigns and events are bound to draw big crowds when the main attraction is this Audi R8 GTR. The car was tuned by German-based company ABT Sportsline and appeared at the 2011 Essen Motor Show. Tuning alterations included using carbon fiber parts to reduce weight, adding Recaro racing seats, a steel roll bar and police lights, and upping the horsepower of the car’s 5.2L V10 engine from 518 to 620. This supercar can zip from 0 to 62 mph (100 km/h) in just 3.2 seconds, and with a top speed of 202 mph (325 km/h), it could give fleeing criminals more than a run for their money. What’s more, although it was only used for show, the Audi may have done more to encourage safety and proper tuning practices than if it were a regular patrol car. 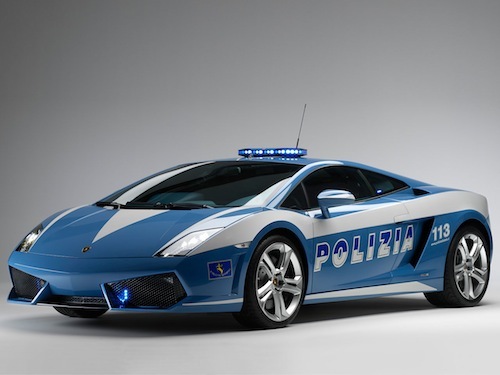 In May 2004, Lamborghini gave the Italian State Police (Polizia di Stato) a Lamborghini Gallardo to celebrate the organization’s 152nd anniversary, and another one was bequeathed the Polizia the following year. 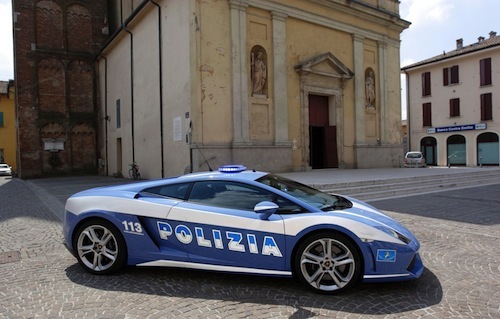 Then in 2008, the State Police received Lamborghini’s latest model, the Lamborghini Gallardo LP560-4. The 2008 vehicle was used by the Lazio Highway Police Department to increase presence on the country’s roadways. Accidents and crime prevention were at the top of the to-do list – and for good reason. According to a 2009 article, in 2008, 4,731 people were killed in car accidents in Italy. The Gallardo LP560-4 has a top speed of 203 mph (327 km/h) and goes from 0 to 62 mph (100 km/h) in 3.7 seconds. It has a 560 horsepower, 5.2L V10 engine and is undoubtedly a crime-fighting force to be reckoned with. On top of that, the cars are equipped with a high-tech video system, a defibrillator, and a refrigerator for transporting donor organs. Unfortunately, in December 2009, Italian police crashed and wrote off one of the Lamborghini Gallardos when a motorist pulling out of a gas station clipped the vehicle and sent it hurtling into a line of parked cars. 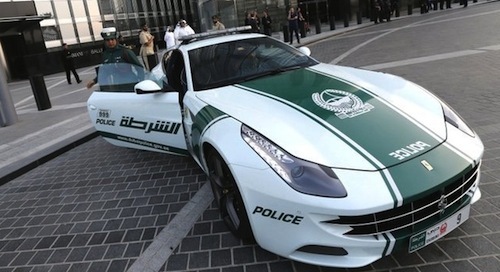 This Ferrari FF wasn’t the first supercar to join Dubai Police’s fleet of crime-preventing vehicles – and it wasn’t the last. This Ferrari, however, is driven exclusively by female officers. Dubai police chief Lieutenant General Dhahi Khalfan Tamim explained the decision to buy the supercar by saying, “Dubai is a unique city and everything in it should reflect its uniqueness and for that reason police will add a Ferrari sports car to its patrol fleet.” The Ferrari, which was added to the fleet in April 2013, can fly down Dubai’s roadways at 208 mph (335 km/h) and goes from 0 to 62 mph (100 km/h) in 3.7 seconds. 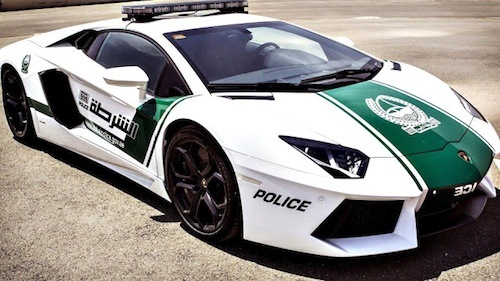 The addition of the Ferrari came only two weeks after Dubai Police acquired a Lamborghini Aventador (see below). According to Dubai Police, both cars were bought to patrol popular tourist areas and show visitors just how “classy” the city is. 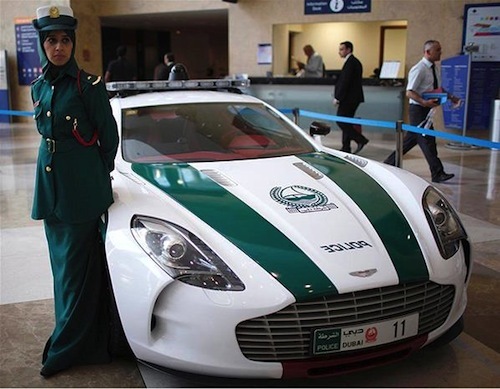 In May 2013, Dubai Police spent $2 million on the Aston Martin One-77 pictured above. The car is extremely rare, with only 77 models existing worldwide. What makes this vehicle rarer still is the fact that it’s one of only seven in the Q-Series. It’s powered by a 7.3 liter, V12 engine and reaches a top speed of 220 mph (354 km/h). Moreover, since it’s able to go from 0 to 60 mph (97 km/h) in a mere 3.5 seconds, this supercar could be put to good use in cracking down on speeding. Illegal road races, stunt driving and a supercar culture have proved major killers in the United Arab Emirates. In fact, one person in Abu Dhabi is killed every 26 hours in traffic accidents. Unfortunately, giving out speeding tickets doesn’t seem to be enough of a deterrent. Emirati driver Sara Al Qaoud says she sometimes gets five speeding tickets a month, but it hasn’t made her slow down. In March 2013, Dubai traffic police claimed they would open a criminal case against anyone going over 124 mph (200 km/h). The Brabus CLS V12 S Rocket pictured here debuted at the 2006 Essen Motor Show in Germany. Tricked out in full police garb, complete with flashing lights and Polizei markings, this superb Mercedes-Benz CLS-Class machine is a beauty to behold and a beast on the road. 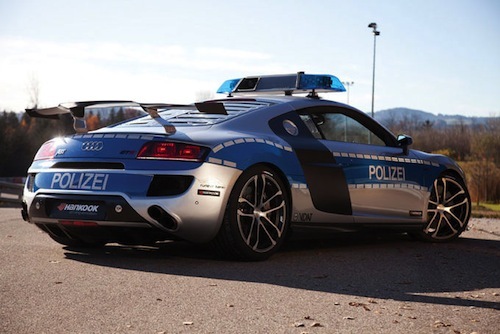 Unfortunately for German police, however, the Rocket won’t be patrolling the streets. The vehicle became the face of German Secretary of Transportation Wolfgang Tiefensee’s Tune It Safe! program, and it was meant to inspire people to modify their cars safely and legally. With a top speed of 225 mph (362 km/h) and the ability to go from 0 to 62 mph (100 km/h) in 3.2 seconds, the Brabus Rocket certainly lives up to its name. Although it would be even cooler to have this supercar out catching criminals on German roadways, perhaps its $550,000 price tag – and that’s not including taxes – makes that slightly impractical.